Generally, citrus trees can be planted any time of year, depending on the specific climate, but should be planted so that the roots have a chance to acclimatize before extreme temperatures are expected. Where the temperatures are cold, spring planting is preferred. Where summers are very hot, fall planting is preferred. Fall is also preferred along the frost-free coastal regions. Citrus can be planted in containers indoors or outdoors, or in the ground. Soil pH should be slightly acidic to about neutral (6.0 to 7.5) and soil depth should be a minimum of 18 inches deep. Sandy to clay loam soils are best, with good drainage a must. A site in full sun protected from severe wind is best. Be aware that some types, such as grapefruit, require more heat to produce sweet, tasty fruit. Planting higher on a slope can provide some protection from cold air. Ensure the tree will have adequate room for growth to maturity. A mature full-sized tree (without pruning for height) can be 20-30 feet tall and equally wide with an extensive root system which can extend up to twice as far as the drip line (the edge of the canopy). Handle the tree gently and protect the roots from damage. Dig a hole about twice as wide as the rootball of the tree and about the same depth as the rootball. Save the soil for backfill; break up large clumps. Soil amendments are not recommended unless the soil is extremely sandy or is heavy clay. Adjust the depth of the hole so that the upper surface of the tree ball is about 1 inch above the surrounding soil. Lower the tree, still in its container, into the hole. Carefully slit one side of the container vertically, then add about 6 to 8 inches of loose backfill (fill the hole about 1/3 full) to stabilize the tree. Then carefully remove the container. Gently tap the loose soil around the rootball immediately, and then promptly fill the rest of the hole with soil, tamping gently as you fill. Fill to the top, leaving the upper 1 inch exposed. Add water directly to the top of the rootball to ensure the roots are kept moist, while keeping the trunk as dry as feasible. Trees should be planted at the same depth as they were in the container. If planted too deep, soil and water tend to stand against the trunk, which promotes root and crown rots such as Phytophthora. If planted too high, the roots will dry out too quickly. Citrus trees require consistently moist but not soggy soil and they do not like standing water. The root system should not be allowed to dry out, which stresses the tree. Note however, that overwatering and/or poor drainage are also problems, and equally stressful. Citrus trees are evergreen, and should be irrigated year-round, especially during active growth periods, usually late winter or early spring through summer. Most roots are concentrated in the top 24 inches of soil, with the heaviest concentration in the top 12 inches, and can extend as much as twice the width of the tree canopy, or drip line. Young trees with a trunk diameter of less than an inch are especially vulnerable to irrigation issues. Irrigation should be at the root zone area away from the trunk and the bud union to avoid fungal diseases. Newly planted trees should be irrigated well immediately after planting to ensure surface roots stay moist. There are three basic ways to irrigate citrus trees. Build a 3-foot diameter basin around the newly planted tree. Fill the basin until the water penetrates just below the original root ball. Eventually the water should penetrate 2-3 feet deep. Basin-flooding is appropriate only for young trees the first year after planting, and then should be broken down. The basin should also be broken down during the rainy season of the first year to avoid standing water, especially around the tree trunk. Sprinkler irrigation should be used only if the system delivers enough water to wet the entire root system of the tree. Supplemental irrigation using a hose may be needed to keep the root ball moist. As mentioned above, a basin may help during the first year after planting a young tree to help hold water over the root ball so it can penetrate well. If the tree is located in a lawn area (not an ideal location), sprinkler irrigation is not recommended for the citrus tree. Lawn sprinklers are effective for watering the turf to a depth of several inches, but the same sprinklers are not also effective in providing water to citrus tree roots which are about 2 feet deep. Overwatering the surface roots is common when the tree is irrigated along with the lawn; this is not a good practice. Drip irrigation systems dispense water slowly (measured in gallons per hour) through emitters. If used, drip irrigation emitters should be anchored to the rootball to ensure the emitters remain in place and the root ball is receiving adequate moisture. Check emitters frequently for clogging. In the first year, the emitter should be over the root ball. During the second year it is important to use two emitters, one on each side and about 8 inches away from the trunk. As the tree matures, more emitters (could be as many as 6 or 8) should be added to ensure adequate coverage of the root zone, including beyond the drip line. Citrus tree roots penetrate to about 24 inches, with the heaviest concentration in the top 12 inches of soil. Feeder roots are in the top 6 to 12 inches of soil. Irrigation frequency is influenced by weather, so the irrigation schedule should be adjusted throughout the year. Irrigation efficiency is also influenced by soil type. Generally, irrigate when the top few inches of the soil are dry and the rest of the root zone is slightly moist. Young trees should be irrigated at least every 5 to 10 days during the summer months, or more frequently if the root system dries out, and more frequently in hot, dry and windy conditions. Mature trees require less frequent irrigation. Irrigation should also be less frequent when the weather is cool or overcast. In general, 2 to 5 gallons of water should be applied to a newly planted tree at each watering, as long as there is no standing water and the soil is not soggy. 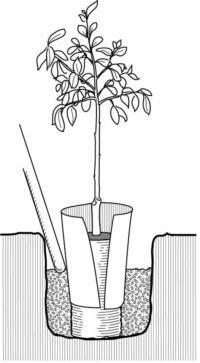 Established trees should be watered so that the entire root zone is moist. A soil probe is a useful tool to determine the depth of irrigation. The soil should be sampled to a depth of about 12 inches to determine soil moisture content. A mature tree with an extensive root system requires more water to wet its larger root zone than a young tree with a smaller root mass. However, the root system of a young tree dries out more quickly. To ensure good crops, the tree needs adequate nutrition. Nutrient deficiencies reduce yield and adversely affect size, color, sweetness and peel texture of fruit. Typically, nitrogen is the nutrient most often required. In some soils, other minerals may be deficient. A soil analysis can be helpful. A complete organic fertilizer with adequate nitrogen will generally supply the other required nutrients such as iron, zinc, magnesium, phosphorus, potassium. Young nonbearing trees have different nitrogen requirements than older, bearing trees. In the nonbearing years, the goal is to encourage growth. For the first 1-2 years, apply 2 tablespoons of nitrogen fertilizer 3 to 4 times per year (approximately one-tenth of a pound per year), sprinkling it evenly over the root zone and then watering well. During the third year, the amount of nitrogen fertilizer can be increased to 4-5 tablespoons per application, or approximately one-quarter pound per year. For a 4-year old tree the amount can be doubled again, to 8 tablespoons 3 to 4 times per year (approximately one-half pound per year), applied evenly around the drip line and watered in well. For older, fully bearing citrus trees of average size, the general recommendation is to apply about 1 pound of nitrogen per tree per year. Depending on the specific fertilizer used the amount to apply can be more than 1 pound. Read and follow package instructions. Fertilizer should be applied in late winter or early spring, prior to the spring growth period. Fertilizer should not be applied in the summer or fall for oranges and grapefruit to avoid problems with thickening fruit rind. However, lemons benefit from nitrogen fertilizer in the summer months. The fertilizer should be scattered evenly under the tree and at least 1 to 2 feet beyond the drip line, and then watered in well. Do not apply fertilizer to frost-damaged trees until the full extent of the damage is known. If severely damaged, fertilizing is not recommended until the tree regains the full canopy growth. Since trees in containers need to be irrigated more frequently than trees in the ground, they also require more frequent applications of fertilizer. A complete (nitrogen plus other nutrients), slow-release fertilizer is recommended; apply per the label instructions. Chelated iron is also more often required for container grown trees, and should be applied per the label instructions. 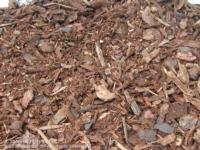 Using mulch has many benefits to citrus trees. Mulch can be applied as a 2-inch layer on top of the ground underneath the tree, out to beyond the drip line, but at least 6 inches away from the trunk. Mulch will control weeds so that digging or cultivating under citrus trees can be avoided, as their surface roots are shallow. In very hot, sunny areas, protect the trunk and large limbs from sunburn, particularly after pruning that exposes limbs to the sun. Lemons are especially susceptible. Wrap the trunk of a newly planted tree with newspapers or tree wraps and tie loosely. Paint the trunks and exposed limbs of older trees with white, water-based latex paint diluted 1:1 with water. Young citrus trees are susceptible to frost damage. For short-term protection of the trunk, options include an insulating wrap of corrugated cardboard, several layers of newspapers, corn stalks, or thermal wraps. Wrap to a point above the bud union. If the tree suffers frost damage, do not cut away damaged parts until new growth is established in the spring. Do not use plastic to cover tree trunks or foliage. 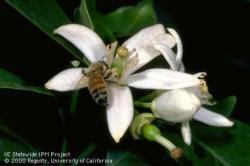 Read more about frost protection for citrus and other subtropical fruit trees. Read more about citrus trees.